ExpertGPS allows you to convert any .DXF or CAD drawing to KML format for instant viewing in Google Earth. 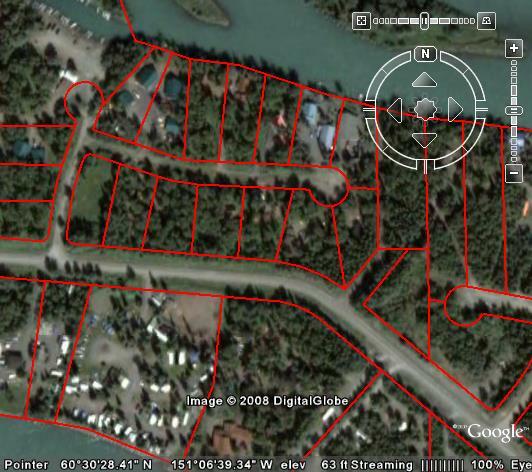 Now you can use Google Earth to visualize any site plan, parcel map, or other CAD drawing directly over high-resolution color aerial imagery. DXF to KML conversion is a simple, two-step process in ExpertGPS. And unlike other DXF to KML converters, ExpertGPS preserves the colors of all of your layers and allows you to toggle each layer on and off individually in Google Earth. The DXF to KML converter in ExpertGPS is used by oil, gas, and mineral exploration companies to quickly visualize new areas for exploration. Environmental engineering and consulting firms use ExpertGPS to convert CAD drawings to Google Earth's KML format so they can see wetlands and riparian areas prior to a site visit. Civil engineers can view road centerlines and parcel boundaries over the latest, high-resolution aerial imagery available in Google Earth. ExpertGPS provides a low cost, easy-to-use way to convert complex engineering drawings to KML, so anyone can visualize the data in Google Earth. Try ExpertGPS DXF to KML conversion free for 5 days. ExpertGPS isn't just a DXF to KML converter. It also allows you to send DXF data to any Garmin, Magellan, or Lowrance GPS receiver, and to upload GPS readings from the field back into your CAD drawings. It can convert GIS shapefiles to and from KML and DXF. It has a powerful Excel and CSV import function, allowing you to convert any delimited data to DXF, KML, SHP, or even send it to your GPS receiver. If you work with CAD data and need a fast way to convert DXF to KML, ExpertGPS is the tool for you. It's a simple, two-step process which produces a perfectly geo-referenced KML file with all of your layers preserved and super-imposed over Google Earth's latest color imagery. Download ExpertGPS, and start converting and visualizing your DXF files in Google Earth today! DXFtoKML.com is © 1998-2014 TopoGrafix – 24 Kirkland Dr, Stow, MA, USA.